What makes a sunscreen a physical blocker? Do new-wave formulations like clear gels or oils actually work? What exactly does broad spectrum mean? A few of the many questions running through our collective minds as we’re faced with the litany of protection options presented to us nowadays. Before you exercise your purchasing power, may we suggest familiarizing yourself with some essential sunblock vocabulary? Consider this your handy guide to navigating the ever-growing sun care offerings. AKA, the most used sunblock acronyms. “UVB rays are responsible for causing sunburns and play a major role in skin cancers,” explains New York dermatologist Dr. Francesca Fusco. “UVA rays also play a role in skin cancer, but they are known more for being one of the greatest factors in premature aging of the skin.” SPF is a sunblock’s sun protection factor, or the measure of how well you’re protected from those aforementioned ultraviolet B (UVB) rays. 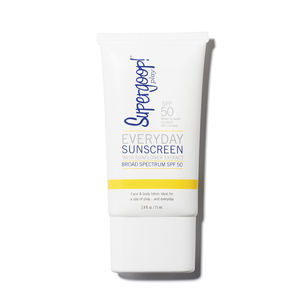 Broad spectrum is the kind of sun protection we should all be seeking out. “SPF only refers to UVB while with broad spectrum you’re talking about also having protection against both UVA, the longer ultraviolet wavelength, and UVB rays,” says Santa Monica-based dermatologist and co-host of The Doctors, Dr. Sonia Batra. “The difference is a mineral block is a physical shield made up of zinc oxide or titanium dioxide, which are particles that sit on top of your skin and just block UV rays, versus chemical sunscreens which work by absorbing the sun’s UV rays and converting it into heat,” explains Batra. While chemical sunscreens have been widely favored for years because their silkier, sheerer consistency usually makes them more blendable, physical (or mineral) formulas have come a long way. “Now, more so than even five years ago, you can get very cosmetically elegant physical sunscreens, that are micronized or tinted, that work really well,” adds Batra. And many dermatologists tend to recommend the latter because they are more friendly for sensitive skin types. When it comes to SPF numbers, is higher always better? Many dermatologists don’t necessarily think so: the standard recommendation is 30 for every day and 50 for those spending extended periods of time outdoors. But, as Batra, who routinely recommends a 30 to patients in her L.A.-based practice, points out, in terms of protection sunblocks can start to level off as the number rises. “An SPF 15 protects against 94% of rays, an SPF 30 is a 97% block, and an SPF 50 is a 98% block so for most of us the benefits start to plateau,” says Batra. What matters far more than the chosen number is using a heavy hand with application. “Most of us are applying only 25% the amount of sunblock that we should be,” says Miami dermatologist Dr. Leslie Baumann. Less is not more when it comes to sunblock and it’s that fact that can lead to a number of issues. “When I see the failures of sunscreen in my practice it’s rarely because of the SPF number and more often that they’re not applying an adequate amount,” adds Batra. Traditional skin care wisdom suggests a half teaspoon for the face and a shotglass amount for the body but for most of us those numbers can be hard to picture, not to mention our bodies come in many shapes and sizes. “I always tell people to apply how much sunscreen they think they need then go back and do it all over again,” suggests Batra. 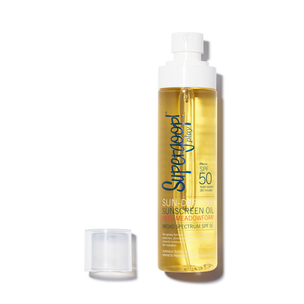 Can a sunblock actually be completely water resistant? Yes, says Dr. Baumann, of the formulas that have to pass intense water immersion testing prior to their SPF testing. But pay close attention to the clock as re-application is even more critical with water-resistant products. “If you’re immersed in water you should really be applying every hour, even if it claims to be resistant up to eighty minutes,” says Batra.